Looking back over November 2018, I have noticed two things. One, the month was filled with superb movies and, two, I haven’t seen nearly enough of these films. The reason for these gaps? Film distribution. Sadly so many movies just don’t make it to screens near me (but I can watch Bohemian Rhapsody all the livelong day). As a result, I have yet to watch Wildlife, Won’t You Be My Neighbor?, The Workshop, Bros: After The Screaming Stops, Assassination Nation and Shoplifters. Some omissions are entirely my fault… I just wasn’t able to catch Juliet, Naked or Overlord. Finally, I am looking forward to watching Creed 2, Wreck-It Ralph 2 (Ralph Breaks The Internet), Anna and the Apocalypse, Disobedience and Three Identical Strangers very soon. I would highly recommend Sorry To Bother You. Yes it is an utterly bizarre cinematic experience but Boots Riley’s debut feature is also darkly funny and brilliantly thought-provoking. One of the most inventive films of the year. Here's my review. Okay, so I am not sure about Aquaman. James Wan’s film could easily go either way. However, I’m keeping an open mind. This breathtaking documentary looks likely to dominate the Oscar race for best documentary feature. I cannot wait to watch… may just have to remind myself to breathe. I cannot wait to watch Roma when it is released (I'll probably see it on Netflix). It looks stunning. I am unlikely to see this film on the big screen - it looks set to have a limited theatrical release. However, this psychological thriller (based on the infamous 1892 murders of the Borden family) is on my must-watch list. I’ll admit that I do not know much about Mortal Engines. However, based on the best selling book by Philip Reeve with a screenplay written by Fran Walsh, Philippa Boyens and Peter Jackson, it looks like an entertaining family adventure. We will have to wait to see if Mary Poppins Returns is practically perfect in every way. However, regardless, this is a must see pre-Christmas movie. What films have you enjoyed in November? 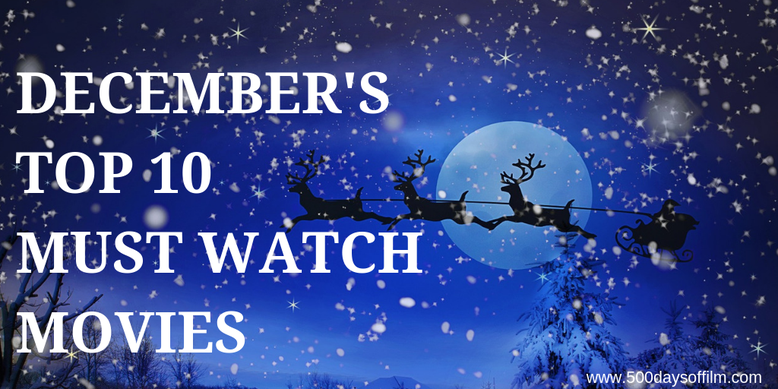 What movies are you most looking forward to watching in December? Let me know in the comments section below or over on Twitter. You can find me @500DaysOfFilm.